South Africa is battling a scourge of rhino poaching fuelled by insatiable demand for their horn in Asia. Most of the demand emanates from China and Vietnam, where the horn is coveted as a traditional medicine, an aphrodisiac or as a status symbol. 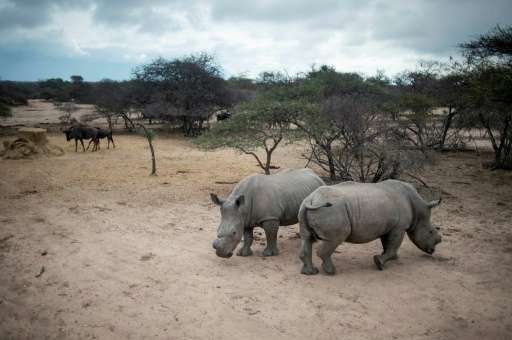 "A total of 529 rhino have been poached since January 2017, compared to 542 in the same period for 2016, representing a decrease of 13 rhinos," Environmental Affairs Minister Edna Molewa told reporters. "These declining numbers do not mean we can proclaim victory (but) the downward trend is being established, which is cause for cautious optimism." The famed Kruger National Park, which has suffered the brunt of the slaughter, has so far this year seen a 34 percent drop in numbers of rhinos killed. But the poaching has shifted elsewhere with the minister reporting that the "number of rhino poached unfortunately increased in some other provinces". The number of rhinos killed climbed steeply in the past decade from just 13 in 2007 reaching a peak of 1,215 in 2014, according to the TRAFFIC wildlife trade monitoring group. It is normally sold in powdered form as a supposed cure for cancer and other diseases.